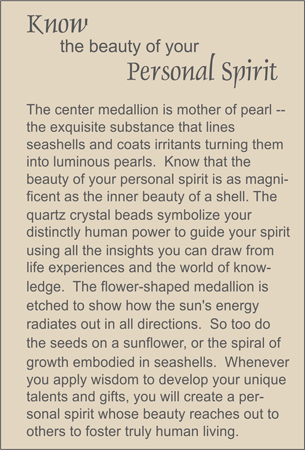 MEDALLION: Mother of pearl medallion from a brown lip shell and etched with spiraling rays. ACCENTS: Smoky quartz pillows and small rock quartz crystal ellipses. COMMENTS: Spirit defines each of us as uniquely gifted human beings.